“An army marches on its stomach” is a quote attributed to Napoleon Bonaparte. Examining the critical connection between food supply and military readiness is just one example of the potential contribution of primary sources on agricultural history to a wide range of regional and international research topics, from economics, to politics, to environmental conditions. For example, an issue from July 14, 1917, of The Chicago Daily Drovers Journal, published scarcely one month after the U.S. entered World War I, speculated on the looming impact of wartime on agriculture. One article reported on government planning for U.S. food export guidelines to neutral countries, while another estimated the effect of the military draft decree on Chicago’s workforce. 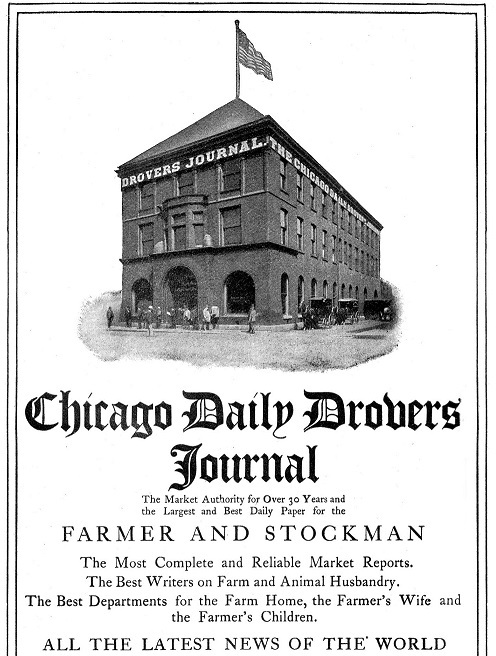 The Daily Drovers Journal went through many iterations since its founding in 1873 as a daily record of activities at and affecting the Chicago Stockyards. CRL recently digitized an extensive run (with various title changes) spanning between 1882 and 1961. The digitization complements efforts to preserve this significant record of livestock production and markets through microfilming by the University of Illinois and the University of Chicago, and holdings were loaned by Illinois for scanning. Digitization of historical collections in the field of agriculture is also the focus of Project Ceres, an outgrowth of the partnership CRL formed in 2012 with the United States Agriculture Information Network (USAIN) and the Agriculture Network Information Center (AgNIC). A third round of digitization awards was announced in June, 2015, while titles recently mounted from 2014-15 Project Ceres initiatives include publications on rural life in Kansas as well as state agricultural experiment station bulletins from seven different states in all regions of the U.S.